The First Great American! 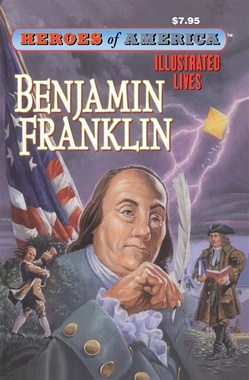 Benjamin Franklin - statesman, writer, inventor, scientist, and fighter for his country's independence - still astonishes us with all that he achieved in his lifetime. He wrote books we still read, invented things we still use, and came up with ideas that affect our lives. Yet Ben was a simple man in many ways, who believed that people should be free to elect their own leaders and steered our great country to its early freedom. From his early experiments in electricity, to developing fire-fighting companies, stoves, postage systems, and countless other things, Ben pioneered many things we take for granted today. Here is the story of a poor boy from a large family who became one of the most admired figures in our history.